*Update - I was chosen as a Winner in Magnolia Down Under Challenge and as Top3 in Midweek Magnolia. Thank you so much for choosing me! I am so honored! 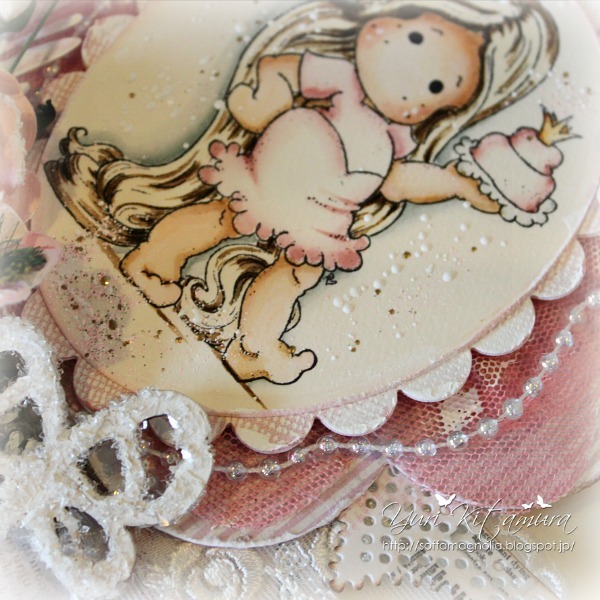 Today I'd like to show you a card I made using one of lovely Tildas from Magnolia's Once Upon a Time Collection 2013 called "Tangle Tilda". The image is stamped with Archival Ink Jet Black on watercolor paper(Mat Thunders - Muse) and coloured with Distress markers & Distress ink pads as always. Around her I've added Shabby Pink Frantage. 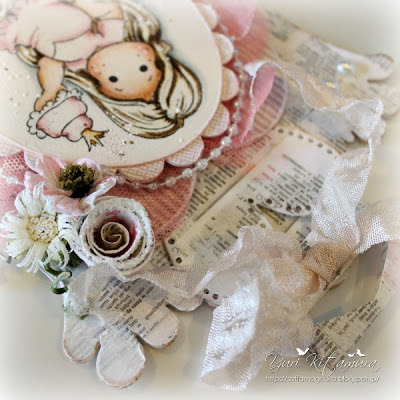 Shaped card edge is made with the new Magnolia DooHickey, called "Tilda Envelope Edge". 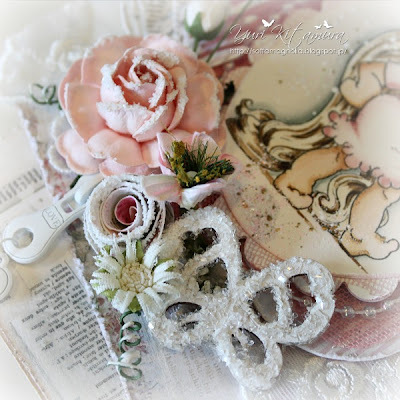 I also used and some of the new Magnolia DooHickey gorgeous die "Vintage Bow Lacing coffee border". I added sparkle to wooden buttefly with Diamond Dust flakes. Image: Tangle Tilda (Once Upon a Time Collection 2013) - Magnolia. Medium : Distress Inks, Distress Markers. 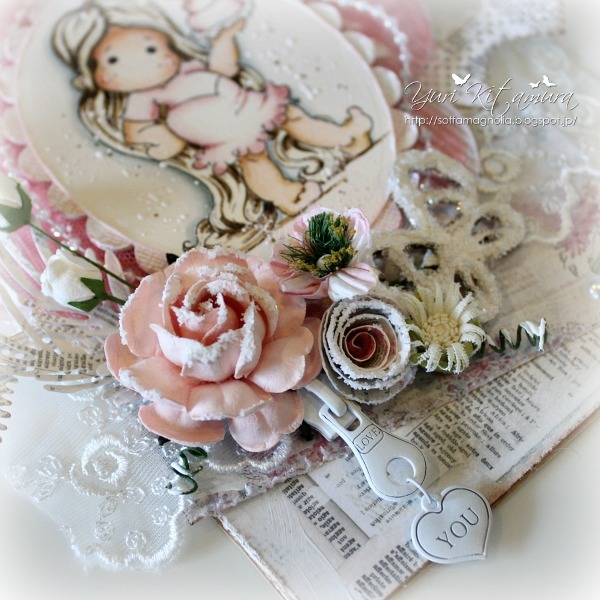 Die: Tilda Envelope Edge, So Wrapped Lovely, Vintage box lacing coffee and Sprawling Ferns - Magnolia DooHickeys, Nestabilities -Spellbinders, Large Frame Flower #1 - GoKreate, Chinese Rose - Marianne Design Creatables. Patterned Paper: Maja Design, Trimcraft. Creative Inspirations - Magnolia Madness! Thank you so much for visiting my blog, and for the sweet comments you take the time to write me. Hope you have a wonderful week! I'll see you again soon! Hi Yuri, your cards are gorgeous! I love the style and design and all the pretty embellishemnts! Your card is magic! Very sweet and tender. This is stunning Yuri. The image, design and embellishments are beautiful. Just perfect, thanks for joining us at Creative Inspirations this week. Oh Yuri! I totally LOVE your project, fab design and gorgeous colouring! Dear Yuri.. your card so very beautiful as the creator too! and how I love every single details you have done, they ae totally gorgeous! wow what a gorgeous creation. Thank you for joining our challenge at the Time for Magnolia challenge!